Sfist has a little crush on James Ormsby. No less than three times in seven months, we have been drawn back to his swanky Gavin-endorsed restaurant in SoMa, Jack Falstaff. We are not even quite sure what the allure of Jack Falstaff is. We'll call it the 'James Ormsby Je ne sais quoi factor'. The attraction is certainly not the look of the space, hidden behind a sleek, industrial doorway. The interior is modern but ordinary, dressed in velvetines and sagemint greens that could have jumped straight from the pages of a West Elm catalogue. The ambience fares well from the low, highly-polished dark wooden ceiling that subdues the sound allowing a dinner conversation to flow with ease, thereby helping to keep the dining experience a relaxing affair. We start with a drink at the bar. The Pear Green Tea Martini is exceptional, displaying all the aroma and ittybittiness of fresh pear. Floating on the top is a pear crisp, so sweet and delectable you might wonder why anyone ever bothered making chips from potatoes. 'Jack Snacks' are small $2 servings (created with the nearby SBC Park crowd in mind and packaged for takeaway), perfect for nibbling on whilst you peruse the menu. We tried the spicy crispy sage leaves and spicy Serrano ham chips, which only lasted long enough to work up a thirst. We choose a very French tasting 2003 Chinon Vielles Vignes at $38 a bottle. The wine list at Jack Falstaff features wine producers who are "getting back to the land" either through organic or biodynamic viticulture which is explained here in Amy's recent interview with Gillian Ballance, Wine Director and Sommelier for PlumpJack Group. When it comes to the food, he's knocked us around a bit has James, we've been all over the scale at Jack Falstaff. Mr Ormsby has the ability to make us weep for joy one minute and then render us almost speechless with confusion the next. We were enchanted with the first taste of a duck-liver creme caramel that has been on the menu since the restaurant opened. But by our third visit, the novelty of Mr Ormsby's efforts to fabricate a plausible replacement for foie gras, in advance of the Californian law that will eventually ban it, has worn off. As Falstaff virgins we were totally seduced by a twice-cooked Niman Ranch pork belly appetizer. This dish, in various guises, has also retained its menu position and is apparently so popular it is likely to run out, as it did for us, seconds before we attempted to order it. Oh, James, James, James, this is so cruel. Are you treating us bad on purpose so we'll be begging to come back for more. And even if we do return for a fourth adventure, the Sonoma Goat cheesecake that rendered us almost delirious on our first and second visits is now nothing more than a distant memory. Likewise, his pot de feu was the stuff dreams are made of . We hope James returns a version of it to the menu next Winter. Whilst we hanker after the stellar dishes we've had the pleasure of eating at Jack Falstaff, equally there are things we would never want to revisit. Pasta made from faro may be healthy, but it doesn't have the makings of an out-to-dinner treat. A duck confit from his first menu was over-sweetened (he comped us for that), and a trio of Pacific Fish crudo we once tried, with the exception of the tuna, was unexciting. 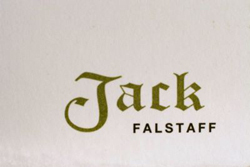 But what about the current state of play at Jack Falstaff? On our most recent cheesecake-free visit, our waitress is a real gem. Professional, extremely knowledgeable about both the wine and the food, as well as being sporty enough to keep the cheekier elements of our party in check with humour and grace. We have an enjoyable meal. Among the starters, a Thai-style beef carpaccio roll rocking with the fresh flavours of mint and peanuts is the dish that makes those of us, who failed to order it, as green as the mint with envy. A skillet filled with simply roasted and salted padron peppers is an interesting and brave choice, but only for diners who have the capacity to accept such simply prepared, unadorned vegetables in a restaurant setting. Tuna tartare is nothing extraordinary. Three of our party of four order the steak. Although, technically, it can't be faulted, it fails to really wow any of us. It's just plain boring. The $22 plate of succulent fried chicken with its crunchy garlicky crust is more tasty, but not something we'd usually rush to order. When it comes to the entrees, we actually prefer the sides. This is where James really pulls some stunners. Creamed corn with lime was incredible. Seriously, we would be more than happy with a bowl of this for dinner and nothing else. Can you send us the recipe, James, pretty please? Consistently good sides, always based on the best of the Farmers' Market, is an area in which Mr Ormsby seems to excel. In the past we have been equally impressed with his Cauliflower Couscous and Curry Butter, lentil dishes and Buttermilk Mashed Red Skin Potatoes. After the creamed corn high, the only direction available to us is back down hill again. If only dessert these days was as good as the Goat Cheesecake nirvana of yore. We order a pavolova that comes with meringue so rock solid and hard we would have been better off with pneumatic drill than a spoon. Pavlova is a dessert inspired by a ballerina. It goes without saying it should be lighter than air. The accompanying fruits including a stunning combination of the freshest cherries and nuttiest of almonds surrounded by smooth whipped cream are deliriously good. He knows how to source his ingredients, that's for sure. They could have stood up perfectly well by themselves, as a dessert in their own right, without some sugary over-cooked egg white as a prop. Dear Sam: Your writing is getting better with each letter of the alphabet, and I'm being quite serious. And thanks for the psychic energy while I visited the sickhouse. It helped. I feel like I can better navigate the treacherous ebb and flow of Bay Area restaurants thanks to you Sam. I don't mind chancing it at a divey joint but for more upscale dining I'd rather it be "tried and true". Thanks too for the mention of my interview with Gillian Ballance the wine director/sommelier. She's really great. Oh rats, both of the previous commenters have already said what I came here to say: Sam, your writing is getting really good! Loved it. BTW, before the two lovely ladies who ran Stars (after that sot Jeremiah Tower left... must remain anonymous, must remain anonymous!) were basically evicted for phony reasons, they served a delicious dish of wood-oven roasted fresh corn kernels -- smoky, almost singed and caramelized -- showered with salt and lime juice. Sound good? Those last three comments were probably comment spam. But I actually agree with them, your writing is an easy read. great post, as always. But it got me curious: what's the other J you were thinking of working a mention of in the review??? sfmike - thanks for saying but i wasnt totally happy with this. I really struggled with it I can tell you. I hope you are feeling better. Take good care of yourself and let me know if you need anything. amy - no - I have to thank you for your interview - it saved me from having to write about the wine! cookie crumb - thanks - I really really struggled with this piece and still wasnt happy with it myself, but good to see people are noticing the effort! yes - and of course that corn sounds good! shane - too funny - when is your own website going to work?